For individual marking solutions, our engravings department manufactures custom made steel marking punches of high quality tool steels. These steel marking punches are engraved exactly to your requirements and component drawings. Our steel marking punches are engraved precisely to your applications regarding material and hardness to reach an optimum of indenting results and durability. Beside the single character steel marking punches, punches can also be manufactured comprising more letters/figures/symbols in one stamp only. These custom made marking stamps allow marking of more than one character with one single stroke, which increases the productivity. Custom made steel stamps are often used when company logos or fixed letter/figure combinations must be marked in mass production. In contrast to a single steel stamp, whole words or number codes can be marked therefore with a single stroke. Saving time and a better marking quality are two convincing arguments! The possible applications are countless, custom made engraved steel stamps are used in all parts of the industrial production processes. 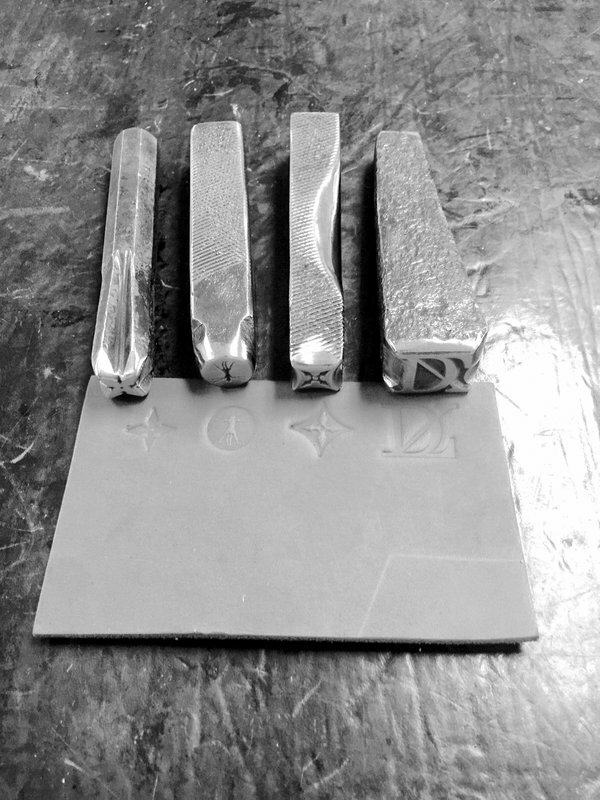 These custom steel stamps are special marking tools with a shank to fit virtually all marking presses. Press dies with shank are usually used for mass-production or serial-production, either with a single percussion press or within an assembly line. The shank, which can also be customized, serves as the connection between the marking die and the marking press. In addition, special shanks for rapid changes of the marking die are available. The possible applications are countless, custom made engraved steel stamps are used in all parts of the industrial production processes. We manufacture press style custom steel stamps either after drawing or after your sample. Standard hand stamps or steel marking punches are the cheapest way to marking letter, figures, signs and symbols manually on plastic, metal, leather and other materials. At its simplest, the mark can be applied to the component by striking the punch by hammer. Our steel stamps are made of high quality chrome steel and are hardened under exact conditions. In contrast to other punches no poor quality steel is used for these products. This leads to a long durability, a maximum in working security and an unbeatable cost/performance ratio. Make sure you mark on a solid, stable bench, located over a support or leg to eliminate any bounce or flexing of the bench surface. Use a large, flat piece of soft steel as a base to lay your parts on when marking with a steel hand stamp. If you’re marking a single 1/4” tall character into tool steel you’ll need approximately 2.1 tons of pressure. Choose a 3/4 to 1-1/4 lb. hammer. (Note – a more experienced operator can usually use a lighter marking hammer.) Speed and accuracy of the hammer blow when striking the stamp is very important. When marking multiple characters using a hand stamp the amount of striking force required is dramatically increased. If you’re marking (4) 1/4″ tall characters at once using a steel hand stamp, the pressure needed will be approximately 12.6 tons. This amount of force would require the use of a 3 to 3-1/2 lb. marking hammer. Place the hand stamp onto the part to be marked and rock it back-and-forth to make sure the stamp is laying perfectly flat on the part. When hitting the steel marking punches with a hammer only strike the stamp once; hit the stamp and pull the hammer away. If the hammer bounces on the stamp more than one time, you will end up with a double or triple impression.